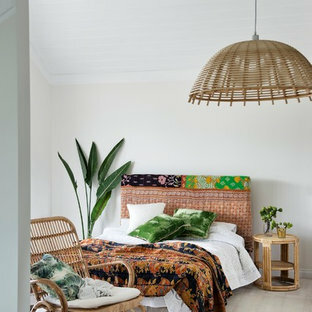 Photo of a tropical guest bedroom in Perth with white walls, light hardwood floors and no fireplace. This is an example of a large eclectic master bedroom in Los Angeles with green walls, carpet, no fireplace and beige floor. 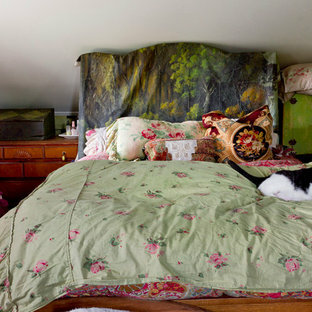 Eclectic guest bedroom in New York. 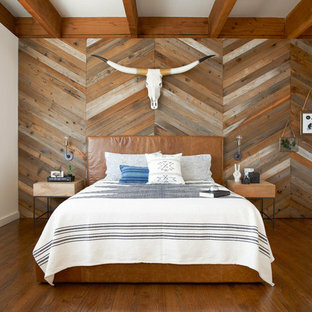 Inspiration for a mid-sized contemporary bedroom in Houston with white walls, dark hardwood floors, no fireplace and brown floor. 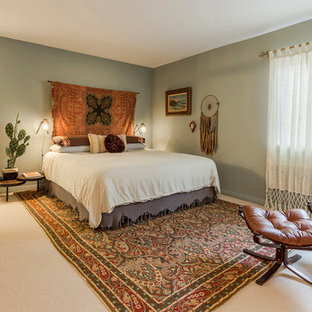 This is an example of an eclectic bedroom in New York with beige walls and medium hardwood floors. 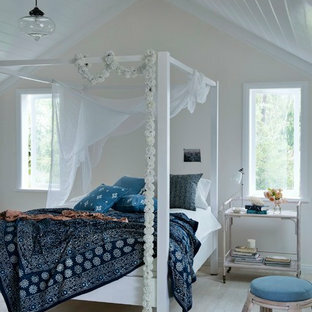 Design ideas for a beach style bedroom in Perth with white walls and light hardwood floors. Design ideas for a contemporary bedroom in Las Vegas with white walls. Contemporary bedroom in San Francisco. 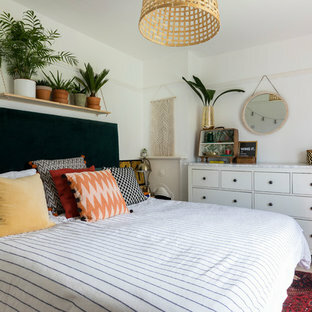 The Jungalow is all about creative reuse, personalization, vivid colors, bold patterns and lots and lots of plants--Jungalow style is tropical and bohemian, very vintage and very cozy. 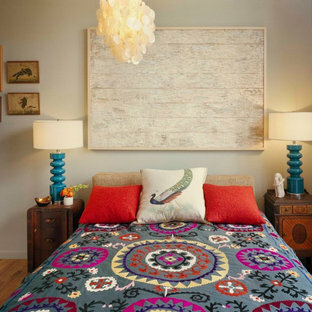 Jungalow is about bringing the eclecticism of nature and the wild--indoors. Master bedroom in San Francisco with white walls and dark hardwood floors. This is an example of a mid-sized contemporary bedroom in London with yellow walls, carpet and beige floor. Small midcentury master bedroom in San Diego with white walls, dark hardwood floors and no fireplace. 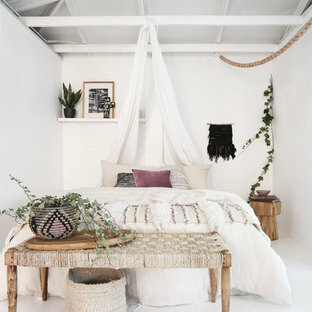 Inspiration for a beach style bedroom in Sydney with white walls, carpet and beige floor. Design ideas for a small midcentury master bedroom in San Diego with white walls, dark hardwood floors and no fireplace. 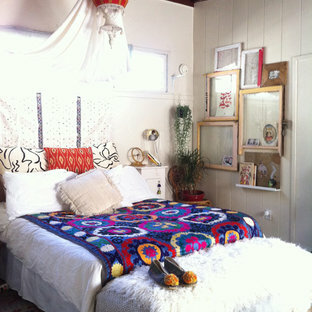 Photo of a mid-sized mediterranean guest bedroom in Los Angeles with multi-coloured walls and medium hardwood floors. 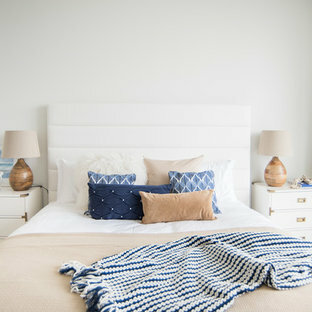 Inspiration for a mid-sized beach style master bedroom in Philadelphia with beige walls, dark hardwood floors and brown floor.